Power does not rest with the electorate. It does not reside with either of the two major political parties. It is not represented by the press. It is not arbitrated by a judiciary that protects us from predators. Power rests with corporations. And corporations gain very lucrative profits from war, even wars we have no chance of winning. All polite appeals to the formal systems of power will not end the wars in Iraq and Afghanistan. We must physically obstruct the war machine or accept a role as its accomplice. The moratorium on anti-war protests in 2004 was designed to help elect the Democratic presidential candidate, Sen. John Kerry. It was a foolish and humiliating concession. Kerry snapped to salute like a windup doll when he was nominated. He talked endlessly about victory in Iraq. He assured the country that he would not have withdrawn from Fallujah. And by the time George W. Bush was elected for another term the anti-war movement had lost its momentum. The effort to return Congress to Democratic control in 2006 and end the war in Iraq became another sad lesson in incredulity. The Democratic Party, once in the majority, funded and expanded the wars in Iraq and Afghanistan. And Barack Obama in 2008 proved to be yet another advertising gimmick for the corporate and military elite. All our efforts to work within the political process to stop these wars have been abject and miserable failures. And while we wasted our time, tens of thousands of Iraqi, Afghan and Pakistani civilians, as well as U.S. soldiers and Marines, were traumatized, maimed and killed. Either you are against war or you are not. Either you use your bodies to defy the war makers and weapons manufacturers until the wars end or you do not. Either you have the dignity and strength of character to denounce those who ridicule or ignore your core moral beliefs—including Obama—or you do not. Either you stand for something or you do not. 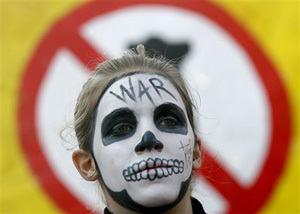 And because so many in the anti-war movement proved to be weak and naive in 2004, 2006 and 2008 we will have to start over. This time we must build an anti-war movement that will hold fast. We must defy the entire system. We must acknowledge that it is not our job to help Democrats win elections. The Democratic Party has amply proved, by its failure to stand up for working men and women, its slavishness to Wall Street and its refusal to end these wars, that it cannot be trusted. We must trust only ourselves. And we must disrupt the system. The next chance, in case you missed the last one, to protest these wars will come Saturday, March 19, the eighth anniversary of the invasion of Iraq. Street demonstrations are scheduled in San Francisco, Los Angeles, Chicago, and Washington, D.C. You can find details on www.answercoalition.org/national/index.html.